Una delle più significative tendenze dell'avanguardia e dell'arte sperimentale è stata la svolta soggettiva verso i materiali di base. A seconda che si trattasse di arti visuali, spaziali o musicali, la riflessione sugli elementi di cui essi sono costituiti (fino al loro riconcepimento), ha fornito un forte impulso creativo agli artisti. Matthew Sperry, Damon Smith e Pascal Niggenkemper sono tre artisti che hanno fatto della fisicità del suono il loro punto di partenza e hanno creato musica avvincente per e attraverso il loro strumento, il contrabbasso. One of the more significant trends in avant garde and experimental art has been the turn to basic materials as subject matter. Whether the arts are visual, spatial or musical, reflection on—and at times a reconception of--the stuff of which they are constituted has provided a major impetus to artists. Matthew Sperry, Damon Smith and Pascal Niggenkemper are three artists who have taken the physicality of sound as their starting point and have created compelling music for and through their instrument—the double bass. 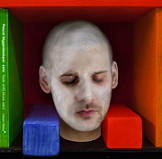 An interest in the basic material of timbre as an independent musical element, and in the compositional and improvisational possibilities offered by the universe of sounds outside of and beyond pitch, was a pronounced trend of postwar experimental and avant garde music and one that continues today. A parallel in the visual arts would be to the Minimalist or Specific Objects sculpture of the 1960s, simple-seeming forms of brute material ostensibly situated at a halfway point between the object as pure in-itself and the object as a worked artifact. By the same token, some timbrally-centered music appears to inhabit what Pierre Schaeffer characterized as the gradation between raw sound and musical language—a gradation in which these specific musical objects, as they might be called, would occupy points somewhere between the two poles. Not raw sounds themselves, they would count as images of raw sounds—raw sound conceived of and transformed by the musical imagination. As with the specific object sculpture their content inheres in the confrontation with material: A kind of brute realism, but one mediated by musical structures and processes. The sound of the double bass played with preparations or radically expanded techniques is suited to a music foregrounding the objecthood of sound. With the right kind of physical alterations and playing methods the instrument’s sound can be altered to the point where its signature is seemingly erased; one might produce music inhabiting that gradient between raw sound—acousmatic sound of undeterminable origins, whose only apparent connection to the double bass is the resonance given it by the instrument’s sounding chamber—and more conventionally musical sound. Such preparations and techniques would, to paraphrase Meyer, make the bass audible as a material thing. But ultimately it would do so through the mediation of musical forms and gestures. 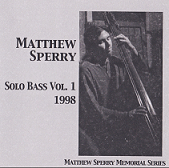 Matthew Sperry, a San Francisco Bay Area double bassist, was before his untimely death at 34 in a traffic accident a major proponent of the prepared double bass. Sperry played a wide variety of music including jazz, rock, klezmer and new art music, and recorded with artists as different as Tom Waits, David Byrne, Anthony Braxton and The Space Between. But it is in two posthumously released solo recordings that his far-ranging improvisations with prepared bass and extended technique—arguably the heart of his music—are documented. The immediate sense Sperry’s playing communicates is a kind of revelry in the sheer weightiness of the instrument’s sound. This comes out in the rumble of low-pitched double stops and clashing chords as well as in the way Sperry seems to break the bass down into its constituent elements—in the rattle and snap of metal strings against the wooden fingerboard or the back of the bow. Some passages of his improvisations approach sheer acousmatic music, the sounds being difficult to identify as belonging to the bass and more akin to a collision of its unassembled parts. The most remarkable aspect of his playing though is his intuitive sense of textural development—a critical consideration for timbrally-centered music. His lines are frequently couched in rapid sequences of changing colors, the phrasing reminiscent of the quick cutting technique of film montage. A signature of his style is the simultaneous use of arco and pizzicato, which allowed him to stack heterogeneous sounds into dense and seemingly precarious vertical structures. Twelve years after his death his music survives him as exemplary of open-minded, free improvisation. Sperry’s example and friendship were pivotal for Damon Smith, a double bassist originally from Spokane, Washington USA and now living in Houston, Texas by way of the Bay Area. Smith started as an electric bassist playing punk and art rock in the early 1990s, but after hearing Peter Kowald’s “Duos: Europa” he switched to double bass and devoted himself to the development of an instrumental language influenced by avant-garde jazz and European free improvisation. A highly physical player, he is particularly strong in the give-and-take of the duet, whether his partner is a dancer, poet or other musician. His Thoughtbeetle, a 2007 set of duets with the eminent double bassist Bertram Turetzky, is a tour-de-force of sympathetic playing. Overall the recording is a finely balanced blend of conventional and expanded methods of playing. While it’s often difficult to tell who’s playing what, certain sounds and gestures seem to be Smith’s: Listening, one can imagine him bodily intervening in various zones of the instrument’s geography, letting each of its individual parts speak for themselves, as it were: Plucking an arpeggio beneath the bridge; scraping and rubbing the frog of the bow sul tasto; bowing the tailpiece or ribs; plucking the strings by the nut. Lyrical passages floating over the creaks, rattles and squeals may be Turetzky’s—or they may not. One can only speculate, but it does seem to be Turetzky coming from the right speaker and Smith from the left. Franco-German double bassist Pascal Niggenkemper, currently living in New York, is an experimentalist with a background in jazz and classical performance. Alone and with fellow bassist Sean Ali, Niggenkemper has come up with ever more unusual ways to prepare a bass—by inserting small blocks on the fingerboard under the strings; rubbing and rattling a tambourine against the strings and fingerboard; preparing the strings with alligator clips and aluminum foil; inserting the base of a metal lampshade between the strings over the bridge. Look with thine ears, his first solo release, is a demonstration of the timbral versatility of his altered instrument. As with Minimalist sculpture, works for the prepared and extended double bass don’t evade compositional conventions but rather adapt them or adapt to them. While Minimalist sculpture tended toward simple, often modular forms, the kind of music represented by the work discussed above is rich in internal relationships and formal diversity. These three recordings show the broad range of formal possibilities by which a music rooted in the image of raw sound can be organized: The disjunctive continuity of montage; a counterpoint moving between and through timbre and melodic lines; the enabling constraints of rhythmic and/or harmonic cycles. Some of these forms are suggested by the material itself and others not; form can precede matter just as much as matter can precede form.